I recently went to the mall to have lunch and hang out with some moms in my mom’s group. We breezed all around the mall with out strollers as a fun way to get out of the house in these intense winter. (NO MORE SNOW PLEASE!!) I’m sure it was funny to see a pack of 6 moms and their babies walking around the mall. Well, before I left I ran into Sur la Table to get some fun things to play around with. I need more bakeware and napkins like I need a hole in my head! But I couldn’t resist and got this pie plate. Well, 2 actually… I ‘needed’ 1 in white and 1 in a color. Totally justified! ha! So I put my new pie plate to good use with this Greek Quiche. When I went to Greece a few years ago I really fell in love with spanakopita, feta, and Greek Salads (which are not like the ones you get from pizzeria here). 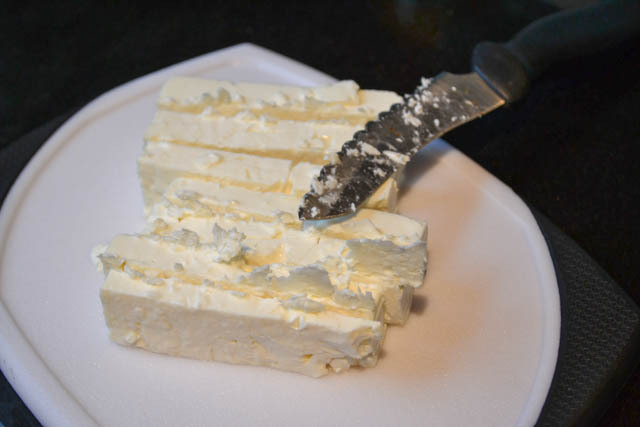 Oh, I had some of the best feta while I was there. Since then I have been insistent on buying feta in a block and in brine since then. It really makes a big difference in texture, moisture, and flavor. Anyway, instead of something sweet this week for this week’s edition, I decided to go with something savory. 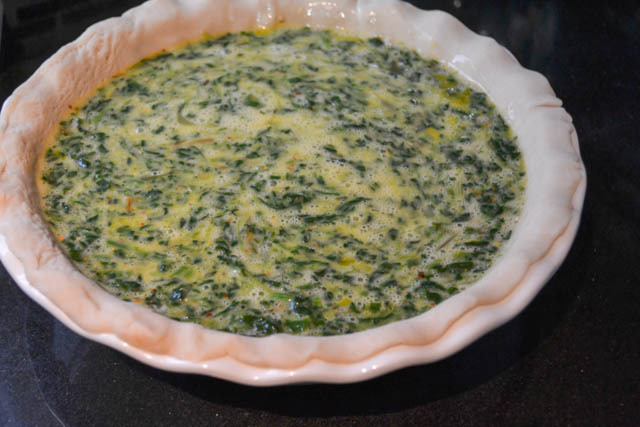 I was thinking back to my trip to Greece and was craving spanakopita recently so I decided to take those flavors and incorporate that into a quiche. We eat so much quiche at home that I’m always thinking of new ways to change things up. 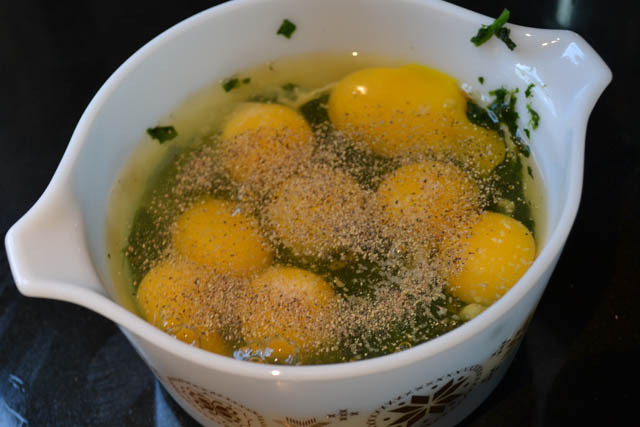 I try it with different meats, vegetables, and cheeses to try different flavor combinations. 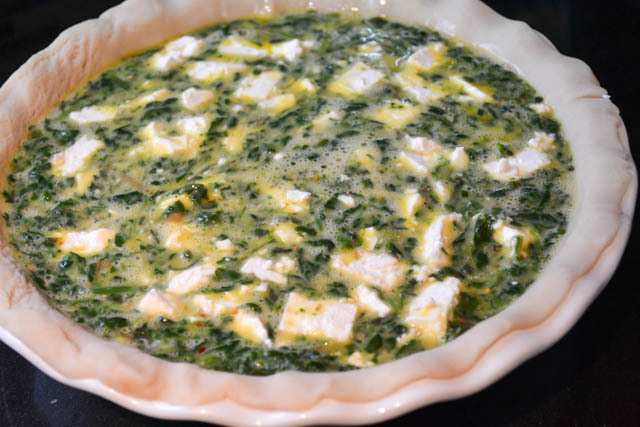 By making it with spinach, feta, oregano, and the slices of tomato you can really enjoy your favorite Greek flavors right at home for breakfast! 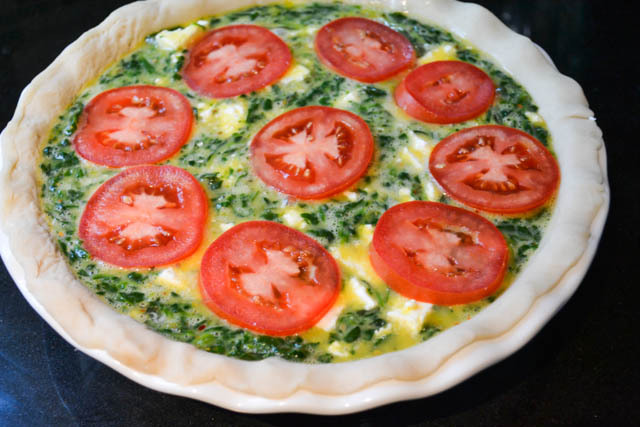 Make this quiche and you’ll enjoy a piece of Greece right at home! Preheat oven to 350 degrees. 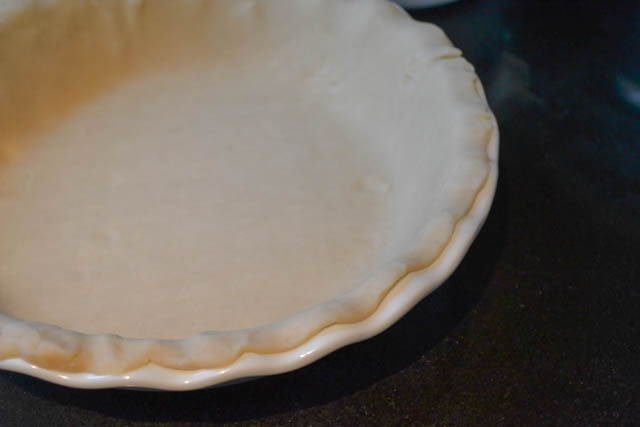 Spray a 9″ pie plate with non-stick cooking spray then place the pie crust into the pie plate. Thoroughly drain the spinach removing as much liquid as possible. 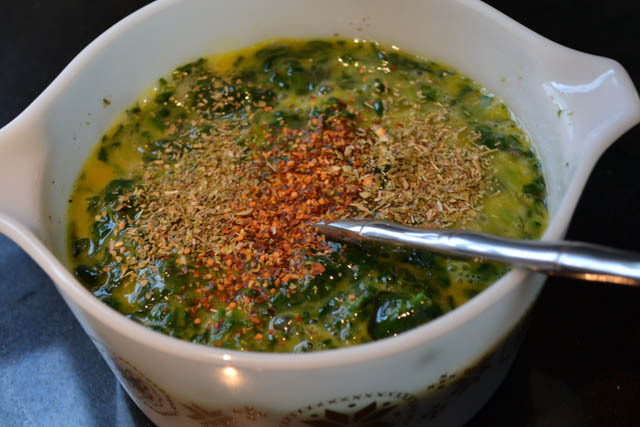 Mix together the spinach, eggs, black pepper, salt, red pepper flakes, and oregano. 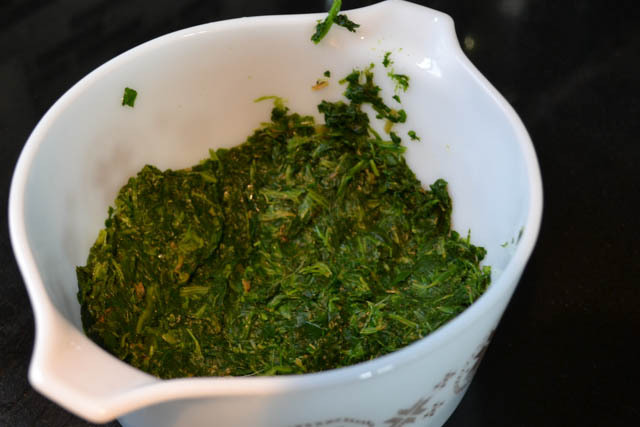 Pour the spinach and egg mixture into the pie crust. Chop up the feta and add to the top of the quiche. Slice the tomato into pieces that are just thinner than a 1/4″ thick. Evenly place 8 slices in a circle around the quiche and place 1 slice in the center. Bake for 50 minutes. Turn off the oven and let sit for another 15-20 minutes, or until set in the center. This rally looks good, I think that I am going to have make this on Sunday. I would think it a good way to take my mind off of yet another snow storm expected then. A hello and a cuddle to Kemper from Otis and me please. I’ve just made this for SRC and I enjoyed it so much! I added a few olives and my husband who’s a real olive fan loved them but I would happily eat it just as it was without the added olives next time!